August 27, 2016 August 26, 2016 Dan O. First dates are always so awkward. Especially when there’s no Starbucks around. Way back before he became the President of the United States, Barack Obama (Parker Sawyers) was just like you or I – he was a young dude, trying to make a difference in this world, be successful, and yes, also try to win the hearts of lovely women. One woman who seems to have captured his heart as of late is a young, ambitious lawyer named Michelle Robinson (Tika Sumpter). So, like any young guy his age would do, he asks her out on a date and they get going on that date, even if Michelle herself doesn’t quite know that it’s a date yet. No worries though, as Barack is using this day solely as a way to pick her brain a bit, show her the kinds of cool and smart stuff he can do, and while they’re at it, get dinner, have a few beers, and yes, even seeing Do the Right Thing, which may make or break the future of what they could possibly have together. Will it all work out in the end? Or will it just be another one of those one-off dates? Of course, we know what happens between Michelle and Barack, but that doesn’t really matter for a flick like Southside With You to work. In fact, even knowing who Michelle and Barack Obama are in the first place, probably shouldn’t matter for a flick like this, because it’s less about who they turn out to be, or what they represent, as much as it’s just about who they were at this time in their lives and how they came together, to love one another and figure out that they both wanted to spend the rest of their lives together. A little romantic, isn’t it? Well, that’s because it is and it’s one of the main reasons why Southside With You is definitely a great little piece of romance, despite it having something of a gimmick being that it’s Barack and Michelle in the romantic-leads. But honestly, that novelty goes away not after long, because the two performances are so good, that they don’t feel like two-bit impersonations, straining for likability or credibility, as much as they just feel like two different “takes” on who these people were when they were younger, and way before the world chewed them up and got ready to spit them back out. Sure, it helps that the two are definitely dead ringers for these two notable figures (Sawyers especially looks so much like Obama that I wouldn’t be surprised if the FBI took a look at his birth certificate), but it also helps that these two are more interested in developing them both as people, not just as caricatures that we see on the news. If anything, Southside With You works best because it’s a snapshot of most young people’s lives, not just Barack and Michelle Obama’s lives in particular. They’re young, out-of-college, not sure what they want to do with the rest of their lives, but know that they have dreams, aspirations, and hopes that they’ll figure it all out soon enough and, eventually, find that one and special someone. In a way, yes, Southside With You works a lot like Richard Linklater’s Before movies did: They’re just a bunch of long, walking-and-talking conversations, but they’re meaningful, entertaining, and most importantly, insightful, in that they show us more about who these people were and just why it is that they fell so in love with each other after all. Sure, a good portion of the movie could be total bull-crap, but it’s enjoyably sweet and heartfelt bull-crap, so what’s the harm? The look on many lady’s faces when they come toe-to-toe with the one and only Barack. Sometimes, little, well-to-do movies like Southside With You need to exist, because they help flesh out a persona or iconic figure that we think we already know everything we need to know about, and don’t anymore information on. And in today’s political landscape, where it seems like the Obama’s all have one foot out the door, it’s interesting to see just who they all once were and where they got their start, even if we all know how life and the world turned out for them. And I don’t mean this as a way to bring out my political ideas or beliefs about the Obama’s, or anything resembling politics whatsoever, I more or less mean to say this as a way to show that a movie like Southside With You deserves to be seen, if solely because it will show people that there are more to our politicians and famous figures than just what’s seen on the tube. Yes, they’re actual human beings who love, care and want to do right. They may not always make the best decisions, nor do they always have the right intentions with every decision that they make, but their humans, just like you or I. That goes for every person, not just Barack, or Michelle Obama, but everyone. Even Donald Trump as much as it may pain for some to say and admit. 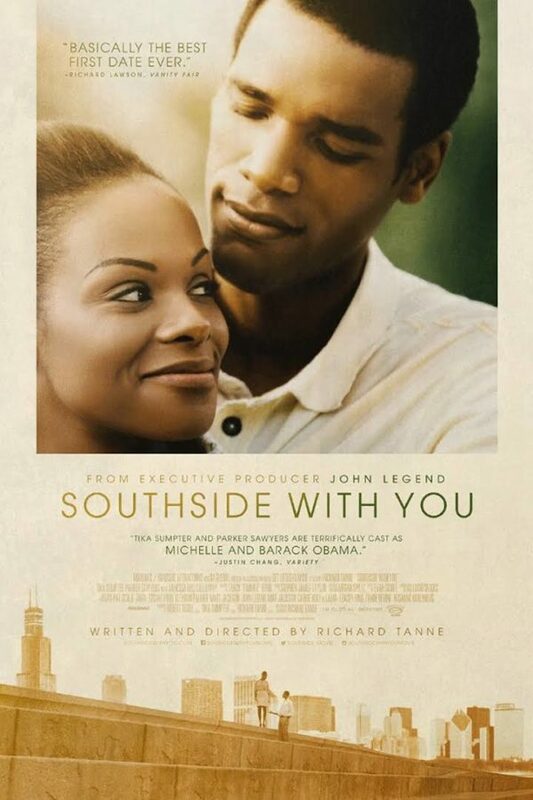 Consensus: Sweet and heartfelt, Southside With You works regardless of one’s political opinions or beliefs, making us all see a little more about Barack and Michelle Obama than ever expected. Take his hand, honey. Trust me. It’ll work out plenty for you. Nice review Dan. IMO this is far from being a soft romantic comedy, Its a warm, intelligent, well ­told bio-pic about two people who became a global power-couple in celebrity politics.